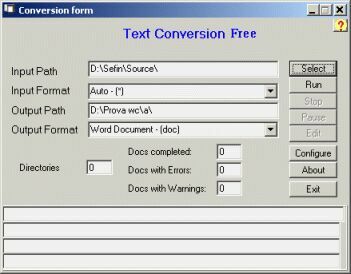 The free version of WordConvs has the conversion function of the full version but don't allow to change the settings of the converted document. 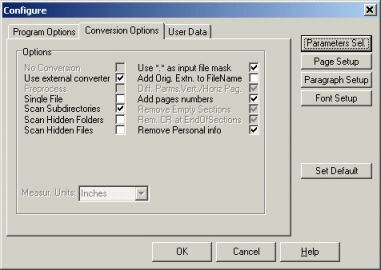 It allows batch conversions of documents with the internal converters of MsWord as well to use an external converter program. In this last case can be useful if the conversion program don't has batch capability or don't allow to scan subdirectories or/and to process hidden files and folders, as WordConvs has these capabilities. It can be useful also if there is not an included mechanism to test the completeness of the conversion, as some converters in case of errors in input file truncate the conversion without any kind of indication of the fact. In case of processing of a large number of file this can be dangerous as you believe that the results are good while you can have as result some truncated document (only partially converted). To test, also if not in a secure way, this case, a program has been inserted which count the words, lines, and characters of the input document. As MsWord has internally the possibility to count them in the output document, it is possible to compare these counters. Naturally the input file counters are only a row approximation as only managing the formatting of the input document it is possible to have a good count. The WC.EXE program included in the setup, is a general program (valid for document written by every word processor) but with a variable level of accuracy of the result, depending on the format of the document. For this reason the possibility to set the threshold of percent difference that give rise to a warning message, has been inserted, as well as the possibility to choose which of the 3 counters (word, lines, characters) to use (they can be used alone or in whichever mix). If a more accurate program is available to you, you can use it by setting its filename in the reserved space on the configuration dialog, as well as the 3 possible strings forming the input line command together with input and output file names set by WordConvs. For an application, with further processing you can see http://tankammo.com/article/javaregex. 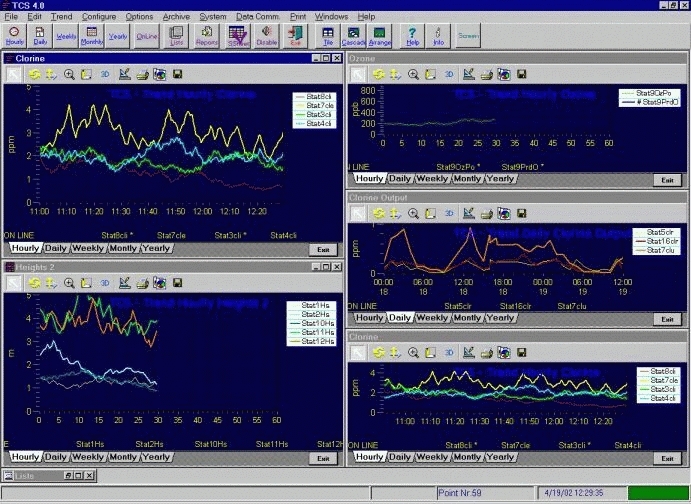 The program is distributed in freeware. Telsys doesn't give support for this version of the program.